So is this an uncle toby’s roll up? I couldn’t see the brand name. I’ve never actually had one but they are popular in kids lunches in Oz. 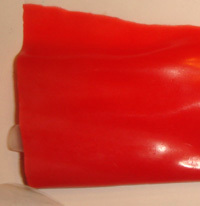 I used to LOVE fruit roll-ups when I was little. I would ball it up and stuff it all in my mouth at once, and then nearly choke to death. But god I loved them. Makes me want to go out and buy them for nostalgia’s sake. I loved the multi-colored fruit roll-ups with cut-outs 😀 The ones that claim are more natural or something always taste like raisins and as you’ve written, spit out. Ugh, Fruit Roll Ups. Gushers and Fruit By The Foot are such better treats. 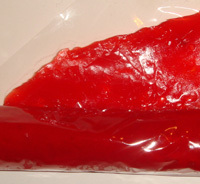 I always liked the idea of fruit leather, which the Fruit Roll seems much more like, but every time I’ve tried any kind of fruit leather, the taste has always kind of put me off. I have no idea what a fruit roll is but I’m pretty sure that I would spit that out too.